Whether drilling a well, choosing a water filter, contemplating a dip in the pond, or getting your pool/spa ready for use... the quality of your water matters and nothing makes obtaining accurate water testing results easier than a water testing meter! 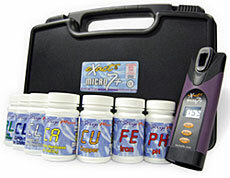 One COULD test for critical water parameters such as lead, iron, heavy metals, pH, total alkalinity, nitrates, nitrites, total hardness, and others using highly subjective test strips which rely upon a person's ability to read colors. One could ALSO use 'wet kits' which require the use of difficult to manage powders, hard to crush tablets, and messy liquid drops. Both methods rely heavily upon a person's ability to perform the test -- and interpret colors. When it comes to the safety and cleanliness of your drinking water, do you want to risk your health and the health of your family? Probably not.